For years now, I have thought of this part of the year as “Cricket Summer,” a sweet and bitter-sweet time of the year. The chirpings of crickets fill the night air with song. It is the last new sound of the warm months, and it will carry through until we have had several frosts. So at once, we are deep in summer yet forewarned that things won’t stay this way. As a parent who has had a child in school for more than two decades, and lately as a teacher, August has long been a month of transition. More than late-December and the festivities of a new year, I have always sensed a greater shift from the old to the new in August. For my children, it has meant advancing to the next grade and new teachers. For me now, it means getting ready to meet my new students. And if one were to compare the relative significance of moving from 2011 to 2012, versus that of moving from elementary to middle school, or even high school to college, it is obvious the passing of one calendar year to the next means little. Ask yourself: Have I ever been a different person on January 1st than I was the day before? Did my life change in any significant way when the ball dropped in Times Square? Now, think about entering kindergarten on the very first day, or entering high school for your senior year. New Year’s day has the Rose Bowl Parade, but entering a new grade at school has the smell of a new binder and spiral bound notebooks, freshly sharpened pencils, perhaps a new backpack, shoes, and maybe even attitude. Add to the mix the tabula rasa component of childhood and adolescent development and, advancing to a new grade in school is a major event. In these final weeks of summer I know the daily routines I have been involved in will be changing. Soon there will be little time (if any) for lying in the hammock or starting the day with a swim in the pond. And as I anticipate the change I will experience as I start teaching in a new school, I am listening to the songs of crickets more intently, grateful for each note yet, keenly aware that change is ahead. 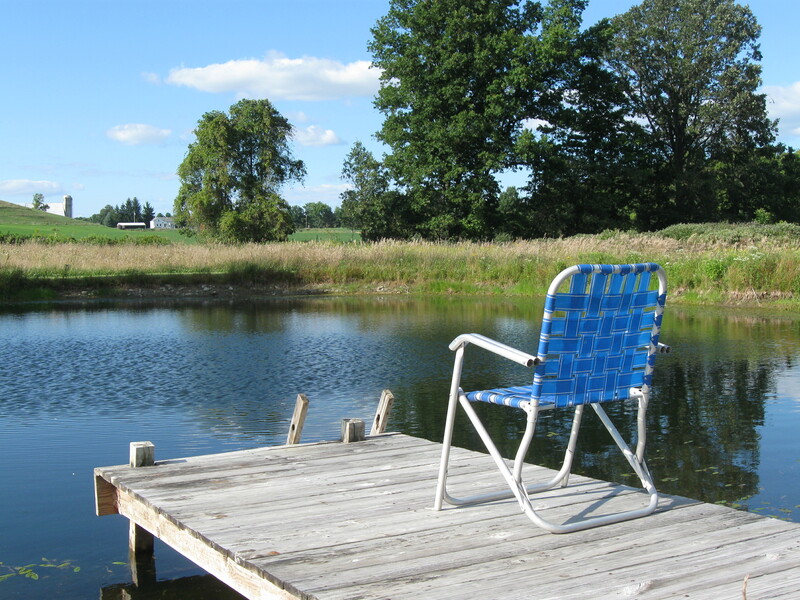 The days of morning swims and reading at the pond are coming to an end. Members of my family have been traveling this summer, none more than my middle son and his wife who were on the road for two months. In between several weeks in Brazil and time in Maine, they also managed to drive across the country, starting in northern California. He has shared many pictures of their adventures with one in particular catching my eye. I have it as the background on my laptop. I think it serves to show me the importance of being in the moment, and being still long enough to appreciate the world. Here’s the picture along with my son’s explanation. 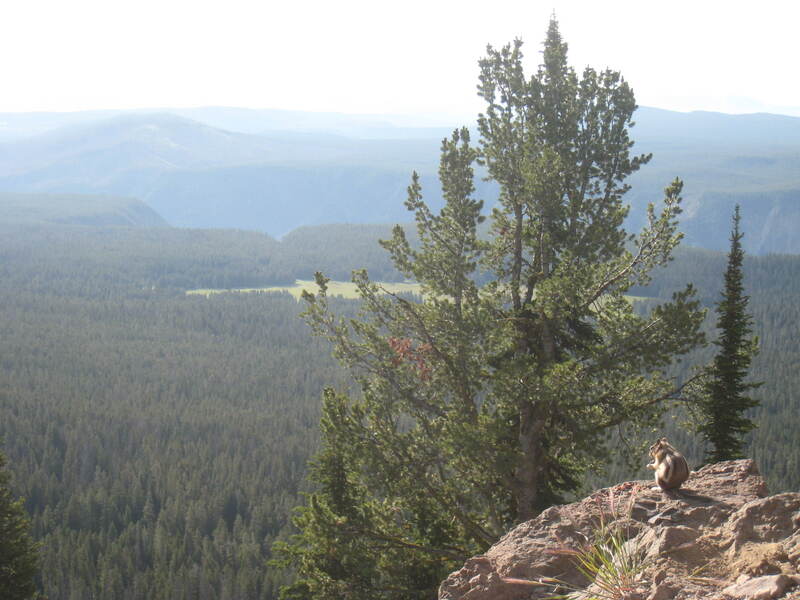 We were alone on the trail as we began an early morning hike up Mount Washburn in Yellowstone National Park. The trail faced southeast and the sun lit up the green slopes above and below us, covered in long grasses and late July flowers in full bloom – yellows, purples, reds and blues. We could see out nearly 100 miles, to the Grand Canyon of Yellowstone a dozen miles away, snaking like a black ribbon across the plateau, to Hayden Valley beyond, and at the farthest point on the horizon, the jutting snow-capped spires of the Grand Tetons. We stopped frequently to take in the view and to catch our breaths on our way up to 10,000 feet. As it turned out, we were not alone in this – all along the trail, fat gray marmots and small chipmunks sat along the trail’s edge, taking in the view over breakfasts of nuts. The marmots tended to bolt into their holes as soon as we approached, but the chipmunks – and this fellow in particular – were so engrossed in their breakfasts of acorns and seemingly so enraptured with the sight, that they kept on munching and looking out while we took photos. There is a saying among historians, one that I have often repeated to my students, that history is written by the winners. I happened to think of this adage last week while vacationing in Nova Scotia, Canada. I was in New Glasgow, on Nova Scotia’s north shore, watching the Olympics on CTV. I’ve been a fan of the Olympics since I was a child, but this was a unique chance to watch the games from another country’s perspective. I can tell you right now that Canadian broadcast coverage does focus on their own athletes, but gives ample airtime to Americans as well. We are their closest, indeed only neighboring country, and they have a good attitude about the U.S. My sense is they appreciate us as a neighbor, at times admire us, often ally themselves with us, and just as often tolerate us. We are the 800 pound gorilla they share a border with. During a break in Olympics coverage a commercial came on that immediately caught my attention as it dealt with the 200th anniversary of the War of 1812. In my home state of New York, little attention is being paid to this bicentennial (our Governor wanted nothing to do with it) despite the state’s major role in the war. In Canada, they seemed to be quite excited to mark the anniversary, and this commercial was meant to promote a government website filled with information. The first line of narration really caught my attention: “In 1812, the United States invaded our territory.” It’s true that the United States did invade Canada in November 1812, though Canada wasn’t a country yet (that would have to wait until 1867) but still a British colony. My perspective on these events is that we weren’t attacking Canada so much as we were attacking the British armies in Canada. One result of the War of 1812: our national anthem. Isn’t it good to know we don’t have to sing all the words Francis Scott Key wrote? And Andrew Jackson would become a national hero when he defeated a sizeable British army at the Battle of New Orleans which was fought two weeks after the peace treaty had been signed in Ghent, Belgium. Never mind, he still became president and earned a post-humous spot on our twenty dollar bill. But for our neighbors to the north, the War of 1812 was something else. It was a moment when Canadians stood up to the Americans. The next time I saw the commercial I was with my friend from New Glasgow, and I interrupted our conversation and said, “Watch this.” When the commercial was over, I realized that she was not upset as I was. To her, the commercial was accurate. I explained to her the differing view an American might take but didn’t press the point. I was on vacation after all, and I was in Canada. I suppose history is written by the winners and at the end of the War of 1812, when both sides simply agreed to stop fighting, both could declare victory. So maybe the commercial wasn’t so wrong. Or maybe, history is written for a targeted audience.